Many might still remember the good, old days when we lived one day at a time, waiting to catch the new episode of the favorite soap opera “Santa Barbara”. For me personally, an episode a day was never enough. I could write a whole book about how the show created by Bridget and Jerome Dobson had inspired me and had an impact on who I am today. The same can be told about other series, such as “Dynasty”, “All My Children”, “As the World Turns”, “The Guiding Light”, “General Hospital”, and the sitcom “One Day at a Time”. Speaking about the latter, Sony Pictures Television has finally released it on DVD. I would say, if anyone tries to define the Golden Age Era of television, I am sure the abovementioned shows will surely belong to that era. 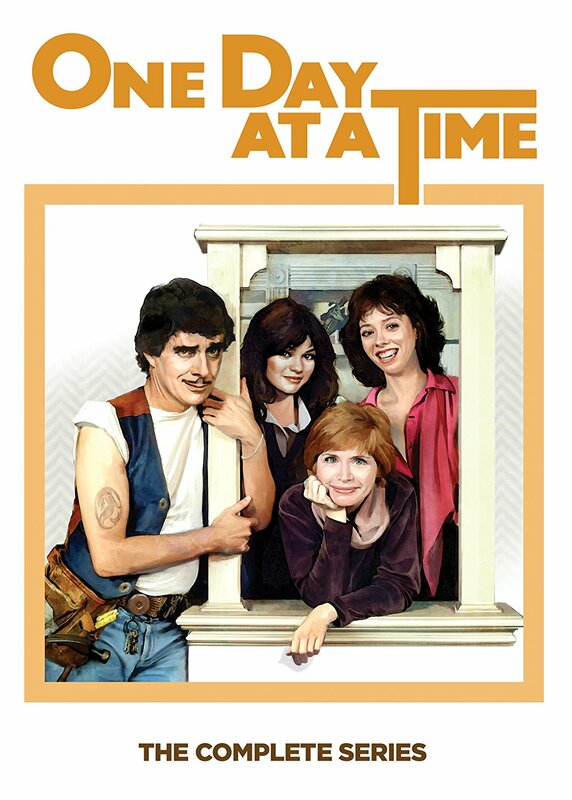 The sitcom “One Day at a Time” follows Ann Romano (Bonnie Franklin) – a recently divorced mother, and her two teenage daughters Barbara (Valerie Bertinelli) and Julie (Mackenzie Phillips). The three of them much start a new life in Indianapolis. As soon as they move to a new apartment, they make friends with the very persistent and handsome superintendent Dwayne Schneider (Pat Harrington Jr.). He helps them as if they are his family. Although his funny and unexpected appearance in the apartment brings joyful moments, it interferes with David’s (Richard Masur) agenda, who is deeply in love with Ann. Aired on CBS from 1975 to 1984, the series created by Allan Manings and Whitney Blake, and developed by Norman Lear became an instant classic. Probably, the key to that success was that the Cooper family felt like real people from across the street; and their family drama told in a comic way could be easy to relate to. Now, Sony Pictures Television brings the classic TV sitcom back on DVD with great additional materials, such as interviews from the entire cast, which is an excellent way to celebrate the short but charming reunion of the cast of “Another Day At A Time”. To me, among many others, “How to Succeed Without Trying” is one of the most interesting episodes of “One Day At A Time”. The episode is meant to be funny – since it is a sitcom – however, in a sad way it reminds us what women had – and perhaps still have – to go through to get hired for a job. If a woman refuses to please her potential employer in any way or manner, she would never get the job. While Ann Romano knows what she is capable of, she still has to experience the tough part of being an attractive woman whose look is appreciated more than her brain. Overall, there is a lot to learn from the four main characters. As years go by – with all ups and downs that life brings their way, they learn how to cope with their sadness and to cherish the joyful moments. Also, if you enjoy the old, good quality TV with carefully written dialogues, “One Day At A Time” is a good reminder of that. Allan Manings’ creation is enough to make us feel respected, valued, and important. Because back in the day, the viewers’ opinion mattered so much more than now. Thus, the viewers like you and me were put on the pedestal. The set is available for pre-order through ShoutFactory.com and Amazon.com.